The lab activity described here was created by Erin Bardar of TERC for the EarthLabs project. Under certain environmental stresses, zooxanthellae algae will vacate their coral hosts, leaving corals without their color and more importantly, their primary food source- a condition known as coral bleaching. Bleaching can be caused by a number of different stresses, but the primary source of bleaching events is believed to be higher than normal sea surface temperatures. During this lab, students will explore images of bleached and diseased corals, invent a way to model what happens in coral polyps during the process of coral bleaching, and use data products from NOAA's Coral Reef Watch to identify areas around the world where corals are at risk for bleaching. 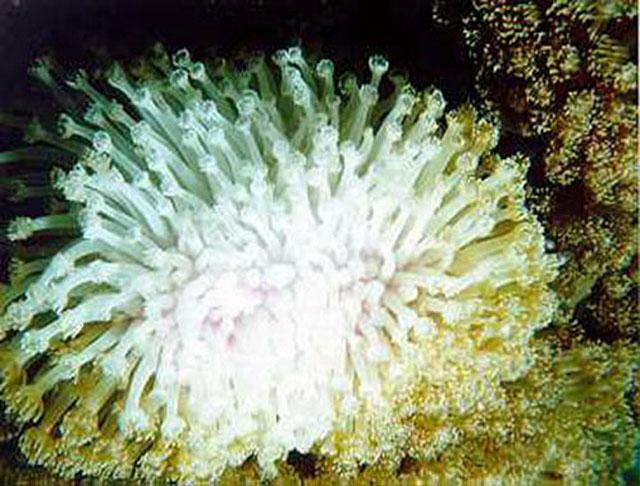 model the process of coral bleaching in coral polyps. Bleached coral. Image courtesy of NASA. This activity follows Lab 5: Trouble in Paradise: Factors That Impact Coral Health, in which students explore various anthropogenic activities that threaten the health and sustainability of coral reefs. Students are now ready to explore one of the most concerning consequences of environmental change that corals face coral bleaching. It is recommended that students work in pairs or small groups for all three parts of this lab. The entire investigation should take approximately 2-3 class periods. In Part B, students explore bleaching hot spot data from NOAA's Coral Reef Watch. They first look at the current global hot spot data and then interpret an animation of global hot spot data for the last 6 months to identify regions that are or have been experiencing thermal stress. In Part C, students explore global degree heating week data to identify regions that are or have been experiencing extended periods of thermal stress and where bleaching is most likely to occur. In Part D, students will apply what they have learned about coral bleaching and interpreting hot spot and degree heating week data to evaluate the thermal stress experienced by corals in Sombrero Reef in the Florida Keys. It is recommended that you familiarize yourself with the Coral Reef Watch data products before students work through the exercises in Parts B-D.
To get a more thorough understanding of coral bleaching and the Coral Reef Watch data products, work through this Coral Bleaching Tutorial.